MAGIC MOMENT: James Willstrop celebrates winning Commonwealth Games gold against Paul Coll. Picture: World Squash Federation/Toni van der Kreek. After winning Commonwealth Games gold in the men’s singles earlier this month, Willstrop was again dubbed the ‘nearly man’ – a tag largely based on a career which, while seeing him reach world No 1, has not delivered when it comes to the biggest and most prestigious titles such as a world or British Open title. And while the tag doesn’t necessarily rankle Willstrop, it is not something that came as too much of a surprise to him – he cites its use as “a bit lazy” – in the aftermath of his stunning win on the Gold Coast. In the various interviews done with The Yorkshire Post over the years, the 34-year-old has always stressed that rankings and titles have never been his main focus – an approach which he maintains now in what may be considered the twilight of his career. 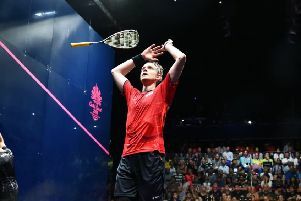 Speaking at Harrogate squash club shortly after returning home with his gold medal – together with the bronze won in the men’s doubles with Declan James – Willstrop is unsure how long he can, or indeed wants to, continue playing at the highest possible level. It’s a reminder that while he remains one of the fiercest competitors on the PSA World Tour – as seen by his recent comeback win against Egypt’s Karim Abdel Gawad in the Grasshopper Cup in Zurich – Willstrop has always preferred to look at the bigger picture, both inside and outside the sport. TOUGH GOING: James Willstrop battles with Paul Coll during the men's singles final on the Gold Coast. Picture: Toni van der Kreek/World Squash Federation. “What I do and how I play the game means a lot more to me than titles and rankings and I think that is quite unusual in a way,” says Willstrop. “You often hear players talking about how they want to win this title, they want to win that title. But, for me, maybe it comes down to me having done it for a long time that the perspective is there with me. That was of chief concern to Willstrop in the run-up heading Down Under. I’d hate to completely alienate myself from it because I love the game - but to stand in a squash club for eight hours a day and coach, that would be hard. “I just wanted to make sure that I got there and that does get edgy in the end because you’re scared,” he explained. “I didn’t obviously want to get injured but I’ve still got to train hard and push myself – otherwise there’s no point. “But, for whatever reason, everything went well in that respect. “So all I was bothered about was getting there and I know that these things don’t work out, so I wasn’t kind of putting too much pressure on myself by thinking ‘I want to win this’. TEAMWORK: Celebrating bronze medal in the men's doubles with Declan James. To help with that pressure, Willstrop has always enjoyed life outside the game as much, if not more, than playing itself. He used to contribute a regular, weekly column for the Yorkshire Evening Post and now does the same for The Guardian. His clear love for writing can be evidenced further when, back in 2012, he wrote the critically-acclaimed book ‘A Shot and a Ghost’ – a candid account of his life on the world tour which was shortlisted for the William Hill Sports Book of the Year award – quite an achievement for something considered by many to remain a ‘minority’ sport. His love of music sees him play guitar regularly,and he is a regular movie and theatre-goer, the latter having provided the impetus for what may feed that need to ‘perform’ in public once he decides to put the racquets and headbands away. Later this month Willstrop will tread the boards in Ariel Dorfman’s play ‘Death And The Maiden’ with Harrogate Dramatic Society. It will not be the first time he has put himself out there as an actor, a spell on the sidelines caused by hip surgery in 2014 giving him a rare window to explore that side of life – something he clearly loves. “I’d love to do something in that area, maybe full-time – I don’t know whether it is possible,” he says. “I’d love to go into acting, writing … all that kind of stuff. I love all those kind of things and I think they are really good for athletes who are pretty intense with what they do – it helps take you out of it. “The arts are really special for that, it is what they do for us all – we go to the cinema to absorb ourselves in a story and get away from our everyday lives and enjoy the story that is being told. “It really helps me on tour so much – I find it helps if you can let yourself go with a film, a book or a podcast or whatever it is nowadays these things are just brilliant. “It was when I got injured, just after the 2014 Commonwealths and I’d had my (hip) surgery and I had a lot more time on my hands than usual because I wasn’t training, just rehabbing and I’d seen a drama group near me before and I got in touch with them. “I just thought I’d go down and get to know them and thought ‘what’s the worst that could happen’ and then I ended up acting and they just said why don’t you try for a part and I did and I got it. That’s not to say that Willstrop is looking to turn his back on a sport which he readily admits has given him so much since taking it up as a youngster under the watchful eye ever since of his coach and father, Malcolm Willstrop. He admits, however, he is unlikely to follow in his father’s footsteps. “I’ve been wrapped up in squash so long … I don’t think I could do it eight hours a day, no – but I wouldn’t want to leave the sport completely,” he explains. “To get away and experience a bit more of life is always good. I’d love to put a bit more back in because being a squash player is pretty selfish – it is a selfish existence really, simply because you’re trying to be the best you can be – so, at some point, I would love to give a bit more back if I could. “I’d hate to completely alienate myself from it because I love the game – but to stand in a squash club for eight hours a day and coach, that would be hard.